Nineteen-year-old Ionut Budisteanu from Romania developed a model for a low-cost self-driving car that uses artificial intelligence. Ionut is not the first one to put out a prototype for fully autonomous vehicles, which Google Inc has been working to develop since 2010. Google’s model would be extremely expensive, costing around $75,000, due to its use of a high-resolution 3D radar. Ionut started thinking of ways to reduce this car’s costs. He came up with eplacing the high-resolution 3D radar with a low-resolution one that is capable of detecting “big” objects, like cars, buildings and trees. The radar is coupled with webcam imagery using artificial intelligence technology capable of recognizing curbs and lane markers and other objects that could be found on the road. The information gathered from the cameras and the radar is processed in real time by multiple computers feeding into a “supervisor” computer program, which determines the car’s path and drives it. 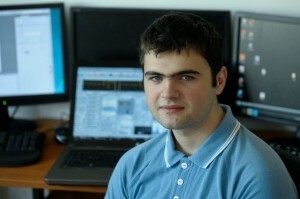 Of the 50 simulations ran by the young Romanian for his fully autonomous car, 47 went flawlessly. In the other three cases, the car did not identify people who were 65 to 100 feet (20 to 30 meters) away. Ionut claims that a slightly higher-resolution 3-D radar would repair the problem and still keep the costs low. His system is expected to cost less than $4,000. For his outstanding innovation, Ionut won the 2013 Gordon E. Moore Award, a $75,000 prize honoring Intel’s co-founder and scientist, during the Intel International Science and Engineering Fair (ISEF). He is the first Romanian to win this competition. He was selected from around 1,600 young scientists coming from more than 433 affiliated fairs in 70 countries. Apart from winning the grand prize, Ionut will also be honored with an asteroid named for him by the Massachusetts Institute of Technology, as it customarily does in such competitions, in order to recognize the winner’s merits. This is the third time that Ionut took part in the Intel ISEF. In 2012, he won prizes worth $14,000, with a project designed to help blind people to recognize images by using their tongues. So far, he has won over 100 other prizes in competitions held in Romania and internationally.